When we first started to look at making this part in our early manufacturing days, we managed to acquire a cutting tool which had originally been used by a manufacturer who supplied elements of the MMM trade. On comparing to an original dipstick profile, we found the tool to be inaccurate in terms of achieving the perfect MG design profile. We therefore, manufactured our own single cut profiling tool which worked very well for our first batch but proved to be a slow process when undertaking large batches. Our tops are now CNC machined and supplied highly polished. We supply the correct calibration dipstick for F and J dipstick models as well as J, P, L and N Types. 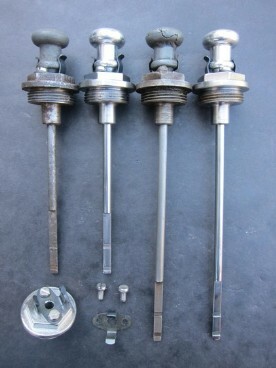 We also supply the correctly calibrated differential dipstick for the K Type. We have had the original differential dipstick holder carefully copied and reproduced in both steel and brass to give choice to the enthusiast. The original clip was always prone to the spring legs breaking off. This is a new, original MMM style spring steel clip. We also manufacture engine dipsticks for all MMM models including the special short J Type (sump mounted) dipstick and holder.